Great for dunking kebabs and crisps in, or slathering on toast, freshly made chutneys are a regular feature in Indian home kitchens where they bring a burst of flavour to the table. Importantly, these are either raw blended ingredients or cooked and then blended – which makes the chopper particularly handy! 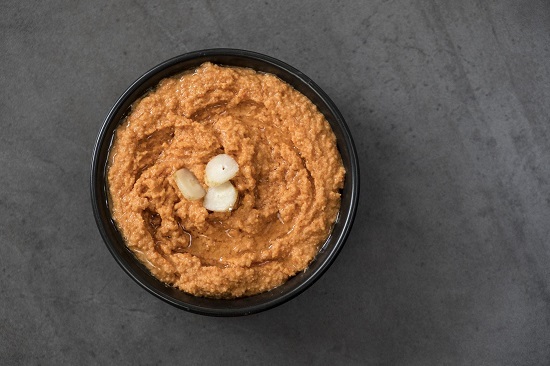 This roasted tomato, garlic and peanut chutney benefits from flavours intensifying in the oven as well as doing away with the need for stirring during cooking. The Kashmiri Chilli powder adds colour to the end result – feel free to substitute this with paprika if you have it handy. I developed this recipe for Braun, who have just launched this new blender and the metal wand came in most handy to pulverise the lot into a smooth paste! Preheat the oven to 200C (180C for fan assisted). Line a baking tray large enough to hold the tomatoes in a single later with parchment. Tip the tomatoes into it and then drop the garlic cloves in at regular intervals. Drizzle three tablespoons of the oil over the tomatoes and garlic and roast for 15 minutes. When the time is up, toss in the raw peanuts, paprika or chilli powder and the whole chilli. Give everything a stir and place back in the oven for another 15-20 minutes until the tomatoes are soft and the garlic and peanuts and golden. Take the pan out and leave to cool. You can reserve a roasted garlic and a few peanuts for garnishing later. When its lukewarm, tip or spoon into the chopper attachment and puree until smooth, adding salt to your taste, in two batches for 7 seconds on the 11 setting. You can add a splash of water if you intend to eat this straightaway, but it will keep longer if you don’t. Spoon the smooth peanut chutney onto a bowl, add salt to your taste and swirl the remaining oil on top. Top with the sliced garlic, and if you fancy, some crushed peanuts. This chutney sounds so nice, I want to make it. You might want to check your link to the Braun blender above as when I clicked on the link to look at the blender, it took me to a gaming site…. to download a game app. Perhaps your site has been hijacked. Thanks for sharing awesome recipe. This is really a yummy recipe. I likes to cook new recipes. Thanks for sharing this post. I will definitely try this. Hi This is fruitful information sharing with us.Thanks to mam https://www.hotelsofnashik.com/. hotels of nashik have same kind of recipe of organic food,healthy food. hotels of nashik is the pioneer in the hotel industry. Hotels of nashik is only one unique website who gives complete information related to Hotels, restaurant, coffee shops. Chutney is a regular feature of Indian kitchen, which gives spice & variety to the food. Thanks for sharing this recipe. I gonna try this, and i hope you sharing this types of recipes. I am very happy to see this post here. The garlic chutney recipe is very good. Thank you so much. Cant wait to try this..I usually make the onions and tamarind version of peanut chutney at home..
I’ve never had Chutney, so I’m definitely giving this a shot. Can I use coconut oil in this recipe? This chutney sounds amazing!!! I love the taste of roasted tomatoes and garlic together!